The Italian-American entrepreneur, Bruno Serato, famous since 2005, thanks to his Los Angeles restaurant Anaheim White House and his non-profit Foundation Caterina’s Club, when he began donating a free plate of pasta a day to over 4,000 children who would otherwise suffer from hunger i.e. 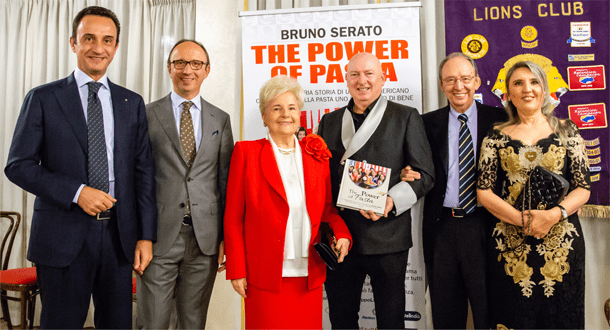 a million meals a year to charity.At the end of last year, he visited Italy to promote his book “The Power of Pasta” (Lumi Group, 2018). It is the Italian translation of what in America is already a best seller which covers his biography and his charity initiative and above all, launches the message: «Stop talking and start doing. Doing is the only way forward, if we really want to create a better world». He put his words into practice… and he uses pasta to do so. 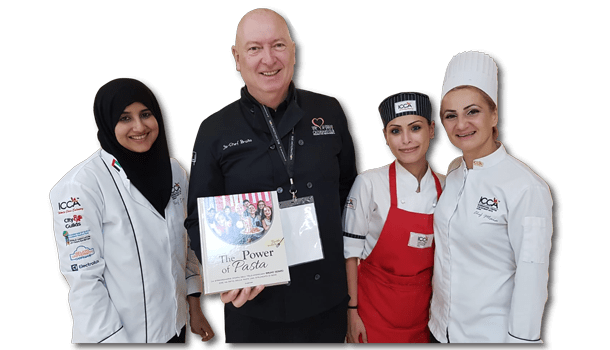 In Italy, “the queen of pasta dishes”, he talked about his charity at company events, meetings in schools and theatres, he entertained audiences of different ages and lifestyles and was an inspiring speaker for institutions and companies. His first stop in Italy was Parma, where he participated in the Italian Pasta Week, promoted by the Barilla Academy. The Barilla family is in fact a huge supporter of solidarity projects. 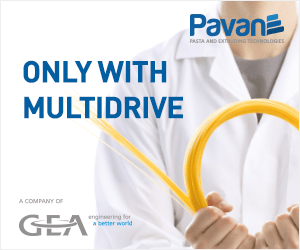 Serato then moved on to Cento, Ferrara, to visit the company Fava, worldwide market leader in the manufacturing of pasta equipment. Fava is a strategic partner in “The Power of Pasta” project and during his trip to Cento, Serato met the whole family: Enrico, Bianca, Luigi, Riccardo and Emanuela. He was very impressed by the Ferrara-based company’s numbers: 85% share of the Italian market and a 40% share of the global market. 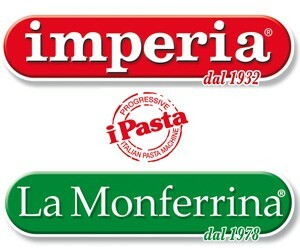 The company was founded in 1937 and is a focal point for pasta producers. It owns several patents and it introduces innovative and technologically avant-garde machines to pasta plants. 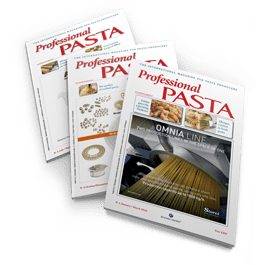 The company has designed and installed over 2,000 pasta lines all over the world, guaranteeing timely and efficient technical services to its clients. 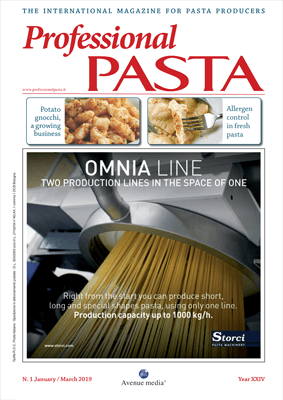 A 6,000 kg/h long-cut pasta line and a 12,000 kg/h short-cut pasta line are among its flagship proposals. Serato went from Italy to Dubai totake part in the World Pasta Day.Every year, on October 25th, the World Pasta Day is celebrated, promoting the consumption and awareness of pasta in the world. For the World Pasta Day in 2017, Serato, the hero of American children, was chosen as the U.S. pasta ambassador. In 2018, once again, Serato was an important testimonial as he explained how his life took an unexpected turn thanks to pasta. It was his mother Caterina (his charity foundation is named after her) who prompted him to donate plates of pasta with tomato sauce to poor children in L.A. «Getting sad when you see poor children doesn’t resolve anything. You must react and do something», Caterina said to her son. He reacted, and he never quit. He didn’t even give up when a fire destroyed his restaurant jeopardizing his charity foundation. It was hard for him, but his determination proved him right: today his restaurant is famous and booming, the charitable foundation receives support from institutions and individuals and it promotes several training projects to help young people find a good job as well as donating contributions to poorer families. CNN included him in the top ten list of social heroes, giving him his first boost to success; he also received other prestigious recognitions such as the Ellis Island Medal of Honour and House of Savoy’s Knightship. Bruno Serato is famous both in and out of the U.S., but his role model promotes a much more important message: it is all about what you do. Through his work, he ensures that underprivileged children and poor people are the protagonists. He also takes them on stage with him to generate public awareness. This makes &quot;his children&quot; feel part of an initiative that can still grow and help others. All you have to do is to look and listen to feel the strength and determination that has been generated by a very simple but effective questione: “What can I do to help?”.